I'm going nautical today and I hope you'll enjoy relaxing on the blue ocean breezes with me. 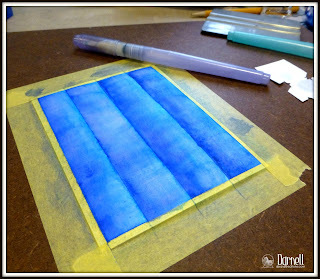 I'm not sure why the hamster and I came up with this background watercolor design, but now that we've done it, it reminds me of an inflatable mattress used for floating in the pool. Mine, of course, would be the one that has a built-in area for my drinkie-poo. If I had a pool. Which I don't. I'll still take the drinkie-poo, though, thank you. The sailboat is from o.o.b. PSX, stamped onto vellum in ultramarine blue Stazon. 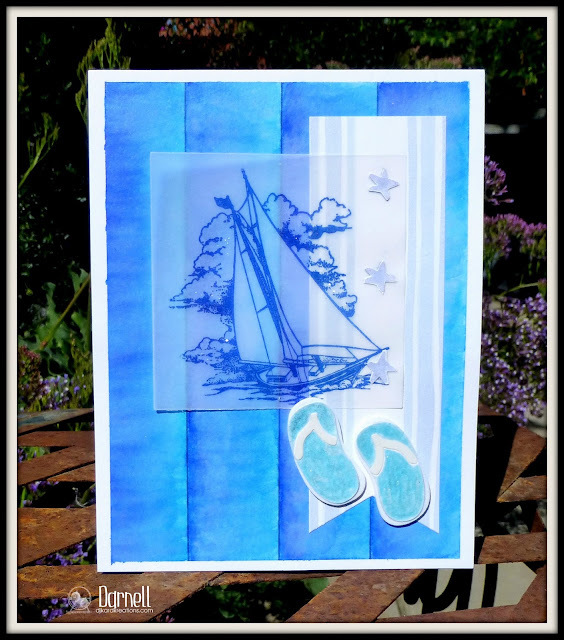 The striped and starred paper and flip flops are from my stash. Of course, I had to Wink the clouds behind the sailboat. It's on the sweet flip flops, too, but the photo didn't capture that so much. Fusion Card Challenge. Below. I am playing in both sides of the fun challenge. Pixie's Snippets Playground. I seem to be doing a lot of OLCs (or nearly) of late, but for this one I was finally able to use some of my bushels of snippets. Words 2 Scrap By: It's a Man's World. I cut a circle with my Lil' Inker dies to make a hole for my shaker schtuff. The surf and wave (NBUS) and sediment were brought to you by Paper Smooches "Wicked Nauticool" stamp set. The 3D lighthouse sticker is from the Paper House. CAS(E) This Sketch. Below. My focus pocus lighthouse is off to the side, but I think I captured the spirit of the sketch. 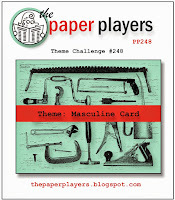 The Paper Players: Masculine Card. 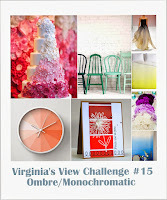 Virginia's View Challenge: Ombre or Monochormatic. After taping down my watercolor paper, I drew lines with my marker to guide me. FYI, I also have one of the wide aqua brushes, which was perfect for this design. Here you can see where I added dark blue along the lines and then just pulled the color to the right. 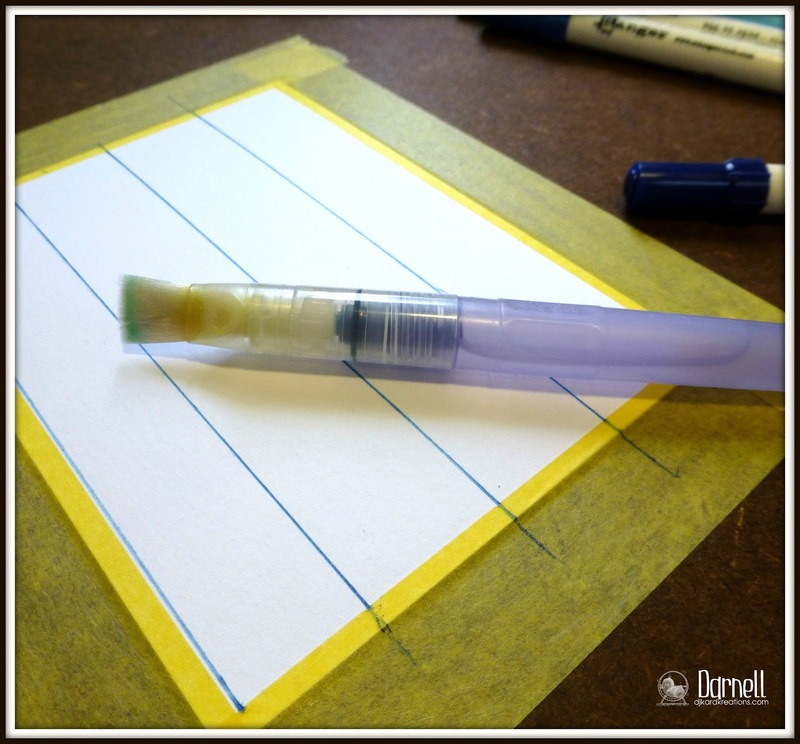 I found it was easier (for this pattern) to work from the right side of the paper to the left so that my hand would stop pulling as it got to the area that was already filled in to the right. And Jack's your rabbit, there you go! Isn't that fun how it adds dimensation? I'm thinking other smart peoples have already done/seen this before, but we haven't, so Hammy is quite popping his buttons over how clever he is. Having said that, you can see in the photos that I did have some leakage (don't we all?) and warping (don't we all?) because I didn't hit them with the heat gun afters. I'm guessing that's why. I'm still new at coloring with water, so I know you'll be kind. Thank you for sharing all your tips about your placement of sequints on cards! I'm not sure how many of you were joshing me, but I'm planning to embrace the same plan that several of you attest to embracing, t'wit: toss a few up in the air and stick 'em down wherever they fall! We are over the moon that the twins will be arriving early in the morning to spend a long weekend with us! It has been way too long since we've had a sleep-over, what with one thing and another. Now that they are getting older (too fast! ), they are into sports and lots of after-school and weekend activities. Summer vacation is here now, yippie kiyay, so we are hoping to be able to see more of them! I'm off to clean up the Playhouse for them in case they want to make Dad some Father's Day cards. Fabulous blues, in your two cards. Thank you for the tutorial. the lighthouse looks great to the side. 2 fabulous cards Darnell, I love the background! 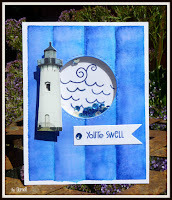 The shaker one is a great idea with the lighthouse....loving all the blue here today!! reminds me of holidays. Pretty cards! Love blue and white for summer! And just as I said that, it's starting to pour down outside, grrr!! That's a great tip for the sequins, have to try that again! Thank you for the photo shoot as to how you made the paper Darnell - the outcomes are fabulous. Have fun with the twins---of course you will! Love the creative background--gotta try that! So glad you joined us at W2SB! I wanna go to where this luscious blue can be found -I'd take sky or water! Have a great time with the kids. I am so glad you shared the 'how to' because I would never have guessed how you made those fantastic 'wood panelled' backgrounds which really do add lots of wonderful dimension to the cards. I have a slight weakness for lighthouses so I love that one with the shaker in, it is fabulous. Love the first one too. Very clever and very beautiful. Really love the blue on your two cards, i have yet to get into the nautical schtuff. Wonder if this technique would work with mixed colours, looks so nice. Dont know if you used a couple of blues but it looks like there is, its really effective. Enjoy your time with the twins. I am off to my sons and we are going to do a movie marathon tomorrow afternoon/night and watch all three Lord of the Rings movies. Elysha has gone to stay with my daughter in Canberra and Ii have done three days at mum and dads so tomorrow is my time. Cant wait. I love your water coloured lilo, Darnell! And now I need a wide Aqua brush! Lovely cards. I especially like the lighthouse one. That is a cool technique. Very cool, thanks for sharing the HOW too! These are stunning Darnell. I really love the way you have created the backgrounds, thank you for tutorial. Yay Darnell - two lovely visions in blue! I love them both (the banner on the first one reminds me of a beach towel!) and I'm afraid you are going to have to race me to that lilo!! I love that each of your watercolour background looks different too - adds to the uniqueness - and a cool technique. Shakers are always fun too! Enjoy your weekend with the twins - and thanks for joining my masculine challenge over at The Paper Players this week! Hi, Darnell.It's been awhile but I'm happy that I stopped by. Blue is my favourite colour, so That was the first attractant, and the cards themselves are awesome! That background technique is very cool. Love the shaker card. I've yet to be successful with one of those. My "shakies" always get stuck in the foam tape. :( Have a wonderful weekend with the grandkids. Wish I was seeing mine this weekend. 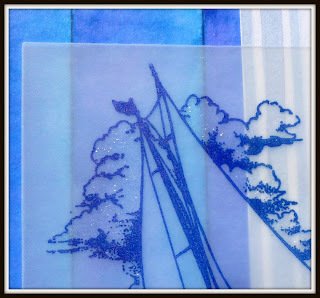 I have a real penchant for nautical ... maybe that's 'cos we had a few sailors in the family (and I dated a few in my time too ... ah happy days) Anyway, I LOVE your cards and your clever tutorial ... The blue just reminds me of the pool I don"t have too (mine's a G&T thanks) ... Have a beautiful weekend with your gorgeous boys! What a neat technique, Darnell. It looks fabulous. Maybe I'll get brave and try it sometime. The colors are so vibrant. Thanks for sharing. You and Hammy should be very proud. Enjoy the weekend with your grandsons! Two wonderful cards Darnell and I adore the watercoloured backgrounds you did. So dimensional too. Have a fun weekend - great to see you in the Playground again, it's been too long! Such fabulous backgrounds! I was wondering how you did them - thank you for the photo tut! Great cards! Lepi, modri voščilnici! Hvala za tutorial. Wow, you created some great backgrounds. Love the color and the theme. I kept looking at that lighthouse and wondering how in the world you did that. Then I read the post, Duh. Very clever sentiment for the ocean swells. I love how your mind works. I'm so glad you get the twins for the weekend. They do grow up so fast and these are the memories you will be making for them. Enjoy the time spent with them. Love the card themes Darnell, I'm a sucker for nautical/ beach themes. (It's the theme of at least 3 rooms in my house) I may have to case the background technique love the texture it created! Have a fantastic weekend and loads of fun with the twins!!!! Gorgeous cards and background, Darnell! Thanks for sharing how you made it! Haven't seen this before - love it! Great way to watercolor the background and thanks for the tutorial! Love both of these. You just must have know that blue is my favorite color!! Have a great weekend! I love the nautical theme, and that blue background is totally awesome! Wonderful cards, Darnell! Have fun with the twins! Cherish your time with them, as they do grow so fast. I love how you created that background! 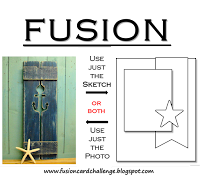 Perfect for your nautical theme! So glad you'll have time with the grandtwins! 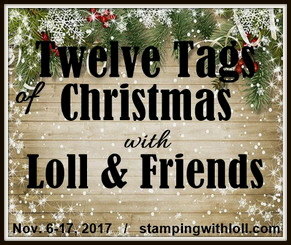 I'm off to take a look back at your posts, been so busy sandwiched between the kids finishing school, and moving my mom out of her house full of memories! Oh, these are wonderful! I love how you made a shaker card with the CTS sketch! I can just feel the waves washing over my feet. Those blue stripes look just like the blues of the Caribbean. Thanks for the demo on how to do that. I love these cards and picture myself with a drink in hand along a beach somewhere inst5ead of this office I am in. I love these cards and the painting. Now please forgive my blondness but did all that coplour come from that one small blue line? If it did-wow and if you added something then I hang my head in shame. I love the shaker card with the sequins and also just love the beach one. Such a fun card Darnell - and it does look like a pool float! Thanks for sharing your technique - and thanks for joining the Paper Players Masculine Challenge! 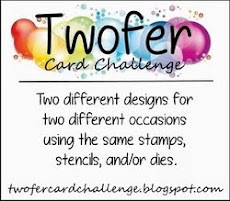 Darnell, I was SO excited to see you posted a second card for our W2SB challenge! And, I love the backgrounds you created for your two posted cards. Very cool... and cool looking! Have fun with the twins this weekend and thanks for joining us again at Words 2 Scrap By! I love your sea themed cards Darnell, the blues are fabulous. Thank you for sharing the background technique, it looks great. Thank you, Thank you SO MUCH for showing how you made those gorgeous beyond words blue backgrounds!! Love these two cards - each of them has a quality about them that is just so nautical and reminiscent of the beach - thanks for sharing these lovelies with us and for being so LOVELY yourself!! Have a wonderful day!! What a great watery background (in more ways than one)! Great idea to use the backgrounds for nautical cards! Have fun with the boys! We had ours last weekend and I'm missing them like crazy! I really like the way you created your background, Darnell. Such a simple technique yet so effective - just how I like techniques to be :) Fabulous masculine cards and I love that you used a PSX stamp - love their stamps! Thanks so much for joining us at The Paper Players. Such a delightful background in a wonderful color!! Ahhh - blue, my favourite colour! I love the shaker card version - what a brilliant idea for a shaker card to represent the water. 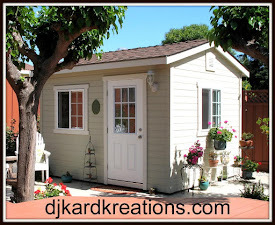 Into my Pinterest shaker board for future inspiration! Two beautiful blue cards, and they make me feel cooler just looking at them! Thx for the fun tutorial, and I hope you have a fabulous weekend with the grands! 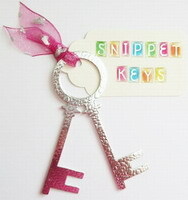 These are simply fabulous Darnell...just so sweet. 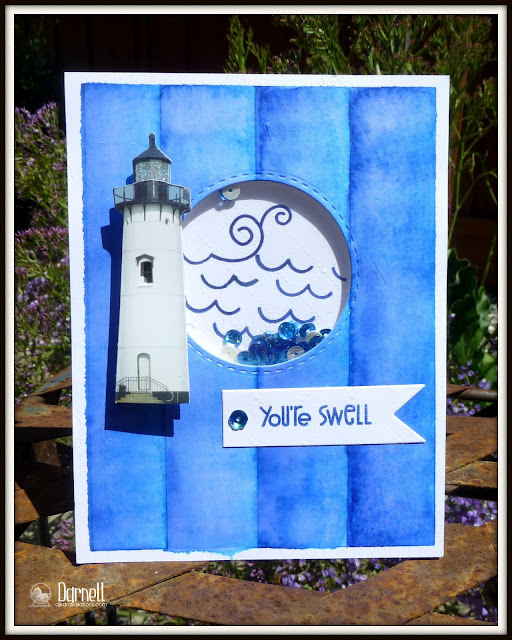 Love your light house shaker is amazing and I am in love with your beautiful background too, so clever and it does not look too hard either. Have a fun weekend with your twins! Two fabulous cards. Thanks for the pics of the background - you are so clever. One day I might give this ago. Great colors -- I love the background you created! Fabulous watery backgrounds n these great cards, Darnell. Have a wonderful weekend full of fun with the twins. YES! I think you just invented a new technique!! You and hamster should give it a clever name! Love how it looks and gives so much dimension to the card. Great lighthouse!! Awesome cards, my friend! Love both your cards and the technique it reminds me of one I did many moons ago to create a fence gosh it had to be 20 years now and I loved it then, I do think yours is heaps better. Thanks for sharing. 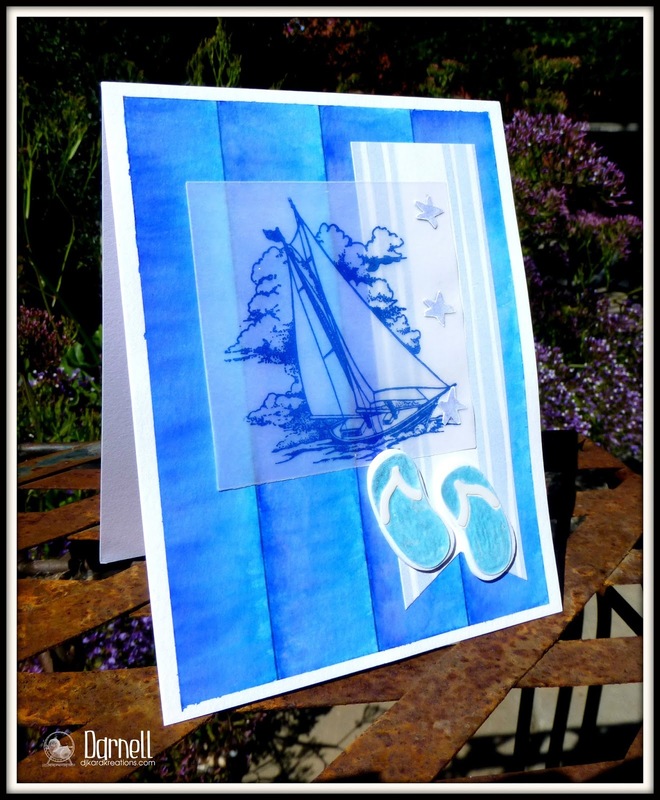 both are wonderful maritime cards, great looking watercolor technique! Thanks for playing along at Case this sketch! 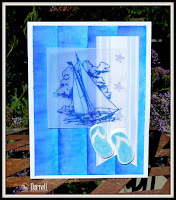 Two wonderful nautycal cards in blue Darnell - love your background! thanks for joining us in the Fusion Challenge! have fun with the twins! How ingenious of you and Hammy! The backgrounds turned out wonderful. Nice cards. Enjoy the twins. A photo tutorial. What's next, Darnell? A video? ;) I am glad you showed us how you made that terrific background. Both cards show it off well. Love the nautical images, very masculine and handsome for Father's Day! Gorgeous cards Darnell and such a useful photo tute! Hope you have a wonderful sleepover. Okay...these are just waaaaaay beyond cool! They seriously look 3D-ish! 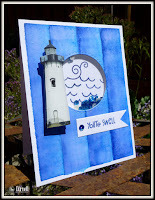 Gorgeous colors and funky lighthouse - love the circle diecut 'wave pool'. Cool technique and great cards! 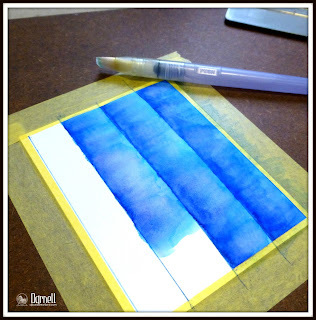 I LOVE the beautiful blue backgrounds you created! They turned out stunning! Wonderful cards of blue! Your background is glorious. In New Zealand, we call that floating mattress a 'lilo.' (Said 'lie-low.) The second card is super-adorable with it's shaker port-hole. Oooo Darling these are just spiffing!! I love these two cards. Just wonderful. The floating things are called lilo's here too!! Hugs to you and Hammy. 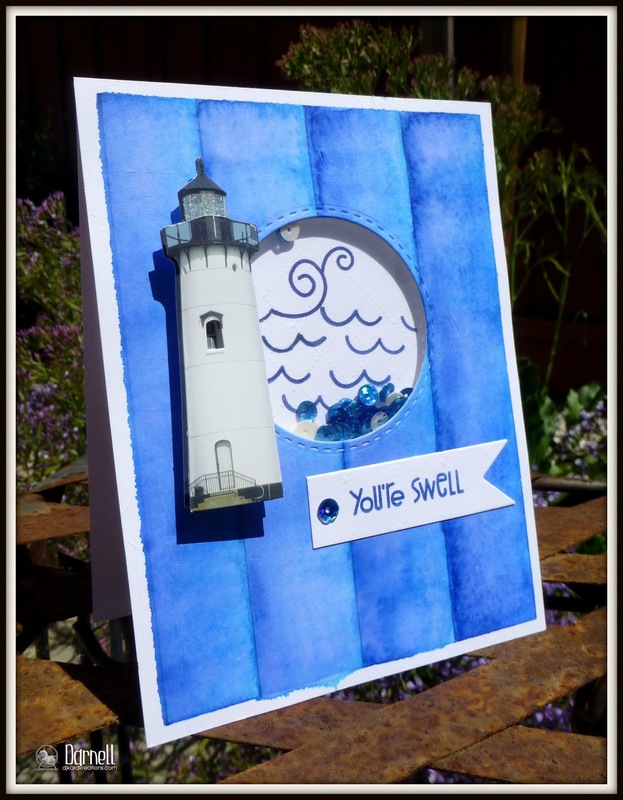 What a fun technique, and so perfect for your nautical cards! Very COOL! Beautiful cards Darnell! Thanks for sharing your technique with us! Thanks so much for playing along with us at Fusion. Super cool background that I can't wait to try! I love how you added so much color without actually coloring the design! The shaker is so fun too with all those sparklies inside. Makes me feel like a kid in a candy shop looking at it! 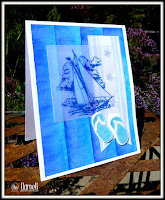 Gorgeous nautical but nice cards Darnell - FABulous watercolour backgrounds! So glad you joined in the fun @ FUSION! Both cards are fabulous. And I love the background you created. Thanks for sharing the pics of how you did it, because I was having a hard time figuring out exactly how you did it just from the first picture. You and Hammy are such a great (and clever) team, Darnell - the two of you created a lovely bg for your nautical cards!!!! Thanks for taking the time to show how you did it!!!! Lovely cards!!! Hope you and the twins had a great time!!! LOVE how you did (and explained!) the background! Perfect! Nifty nautical cards, Darnell! I'm quite loving the blue...and the thought of a drinkie-poo, too! Toss-and-glue sequin placement: that's what I do...and you see how many sequins I 'don't use! Can't believe I missed wishing your awesome twinks time...but I know you had that, and more!